If one considers that Thomas Alva Edison developed a carbon filament lamp only in 1879 and then invented light bulbs according to general historiography, one is surprised if one looks at the episode of the moonlight towers. What happened in L.A. just before? In 1867, the Los Angeles Gas Company, the predecessor of today's Southern California Gas Company, installed 43 new gas lamps along Main Street, making the city safer at night. The gas lighting business was run by five entrepreneurs who produced the gas from asphalt, a pasty substance, and later from oil. At that time, there were only dimly lit gas lanterns hanging from a veranda in the evenings, which were perceived as the only spots of light on the otherwise dark streets of the city. By law, local residents and business owners were later required to hang a lamp outside their doors and illuminate the first two and a half hours of each dark night. Failure to do so resulted in a fine of $2 for the first time and $5 for any further omission. In 1882, C. L. Howland remedied the situation by installing seven streetlight poles, each about 50 metres high, each equipped with three carbon arc lamps and providing light of the order of 3,000 candles. He also installed a small power plant that supplied the electricity for his new street lighting. This happened at about the same time as the event when Thomas Edison completed his Pearl Street power plant in New York. In joyful anticipation, the citizens of L.A. waited eagerly for the moment in history when the first street lights would illuminate the night sky. This moment was December 30, 1882 in front of an admiring crowd of spectators. Mayor Toberman flipped the switch twenty minutes after eight and illuminated two mast points at the same time. A report in the "Express" at that time reported about the historical event: "The main street lighting burned evenly and beautifully and threw a light that resembled the glow of the full moon on snow. The first street light was very unstable, sometimes shining brightly and then fading almost in front of the eyes again. The only complaint so far comes from young couples who don't find any dark places on their way home from church or theatre." The next evening, five more masts were connected. Can it be a little higher? At the same time, the Welcome City Hall in Detroit was even adorned with a 90-metre-high moonlight tower. There were many more of this kind in Detroit shortly afterwards. In the end there were 122 of them, on average 50 to 60 meters high. The lighting radius was probably 500 meters. Each tower was equipped from the outset with 6 lamps. This tower euphoria is said to have illuminated 21 square miles of the city. The fixing ropes alone indicate great optimism. The city must have resembled a spider's web. Detroit was apparently the only city in the world that relied exclusively on the tower system for lighting. Photo: Detroit, 1883, Majestic Building. The arc lamps are said to have been extremely bright and 20 times more energy-efficient than early incandescent lamps (at least) of that time. They were considered too bright for interiors, but were apparently suitable for urban lighting. Carbon or arc lamps (also called electric candles) existed long before Edison's invention (from the beginning of the 19th century). The dazzling white light was produced by two carbon rods connected to a battery. The result was the glistening light of a generated arc. At first it was technically difficult to make these arcs smaller. An electric candle (such an arc lamp) produced a light corresponding to that of 1,500 to 6,000 candles - analogous to the output of 11 to 43 modern 100-watt incandescent lamps. The temperature in the arc could apparently rise to 4,000 degrees Celsius - the highest temperature mankind could reach before the atomic bomb was developed. Perhaps that was the reason why these things were not placed indoors. Nevertheless, it was quite courageous to place such "burning stoves" in urban surroundings. At the end of the 1870s the technology with arc lamps had been improved so that they became not only brighter, but also cheaper and safer. The classic incandescent lamps followed only 70 years later. It is said that the first arched light tower was built in San José, California, in December 1881. It was an impressive 72 metres high and was equipped from the outset with 6 matching arc lamps, which corresponded to a total brightness of 24,000 candles. The figure below shows a tower half the height in the same place, which was later placed there - the original giant did not withstand a storm in 1915 and collapsed. (Photo: Artist not credited, Wikimedia Commons). As if at the push of a button, it all started in New Orleans, where several towers were erected at once. Some of them illuminated the harbour area of the Mississippi River in order to assist with the loading and unloading of the ships at night. A tower at the busy intersection of Canal Street, Bourbon Street and Carondelet Street was erected along with four water pipes to support potential fire-fighting in the nearby multi-storey buildings. At the time, moonlight towers were considered the most energy-efficient way of illuminating an entire city, as only a minimal number of lamps were required. All in all, the lighting pole system was the cheapest way to illuminate an entire city. However, ever higher buildings clearly stood in the way of further development. In this way, uniform illumination would have become more and more complicated. Nevertheless, doubts remain, as extremely positive comments from the past also reach into the present: It was claimed that they could not only illuminate several blocks of flats at the same time, but they were even called "artificial sunlight". They were sometimes described as so bright that people could lay down on the floor with newspapers at night to at least read the headlines. Especially in medium-sized cities without skyscrapers, the moonlight towers were regarded as the future. They burned all day long into the night and gave the people the necessary security. Paris was suspected at that time to have simply copied this moonlight tower technology without permission. The Eiffel Tower had to be used as a stud frame. Other parties claimed that this technology had been used in the French capital for a long time. How was it really ... ? Austin in Texas has been operating 17 towers since the end of the 19th century (before it were 34). Since then, it has been hoped that this will provide the highest possible level of public safety. While everywhere in the country in the 40s of the last century the moonlight towers disappeared from the scene, the towers in Austin remained largely standing. 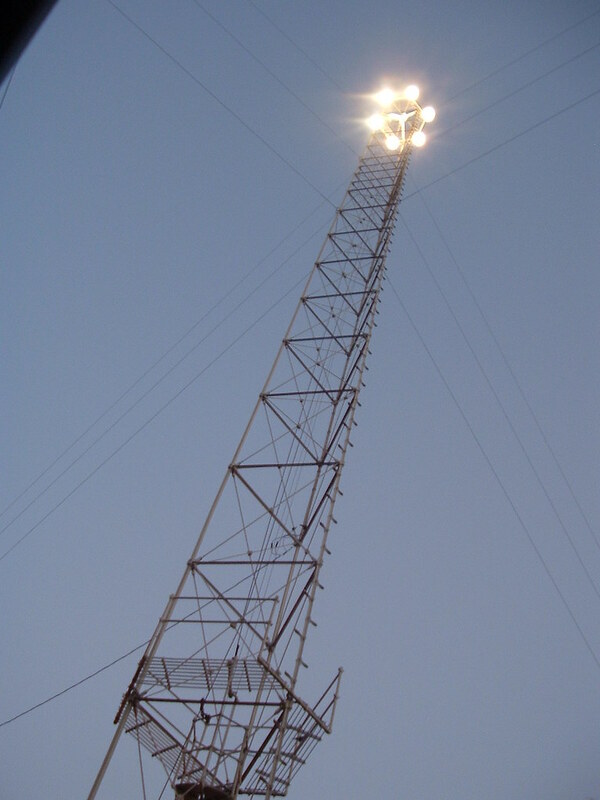 Photo: Moonlight tower in South Austin. Hard to believe that they are still in operation. Photographer: Tim Patterson (photo source see mouseover over the picture).